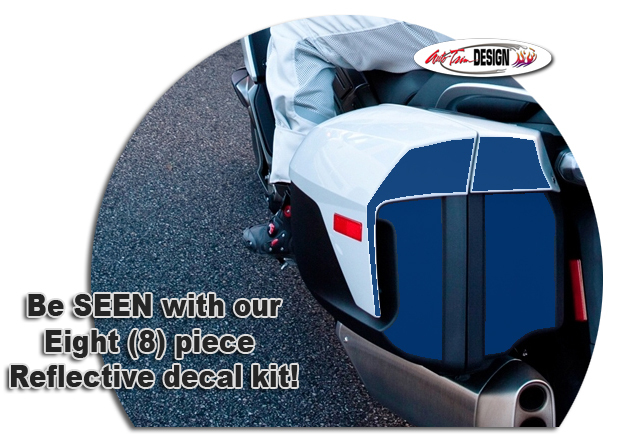 Get noticed with our adhesive-backed 5 mil premium pre-cut Reflective Visibility Decal Set for BMW K1600/R1200RT Motorcycles, available in a wide variety of reflective colors. Created specifically for '11-Current BMW K1600 and '14-Current R 1200 RT bikes, this kit will dress up your bike in no time. Available in a variety of colors and a 7 year outdoor durability, this kit is precut (NO TRIMMING required) and very easy to install in the areas shown.